With all the fuss over Mickey Rooney’s goggle-eyed portrayal of a Japanese businessman in Breakfast at Tiffany’s, it’s east to forget that it’s also the fiftieth anniversary of Flower Drum Song, a movie where none of the leads needed facial prosthetics or special make-up to look Asian. 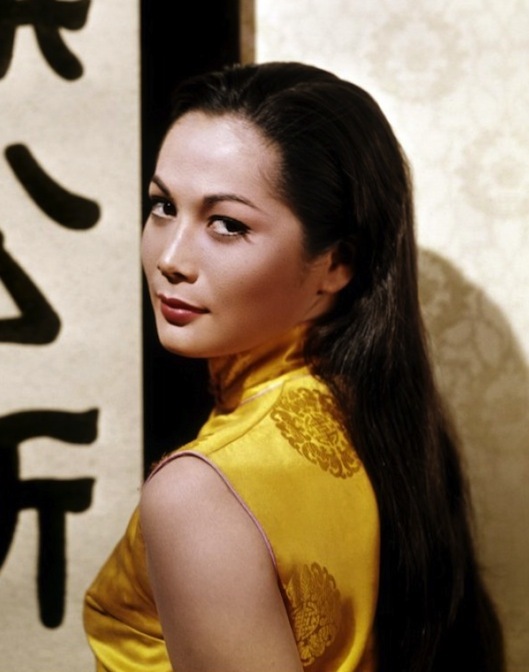 Nancy Kwan, who’s still one of the world’s most beautiful women, appeared on August 11th at the American Cinematheque’s Egyptian Theatre for the premiere of a documentary about her life and a screening of a rare 35 millimeter print of Flower Drum Song. The evening culminated with an emotional reunion of veteran Asian American performers associated with Flower Drum Song, including Alvin Ing, James Hong and Helen Funai Erickson. Ing joked that he holds the recored for the most Flower Drum Song stage performances. 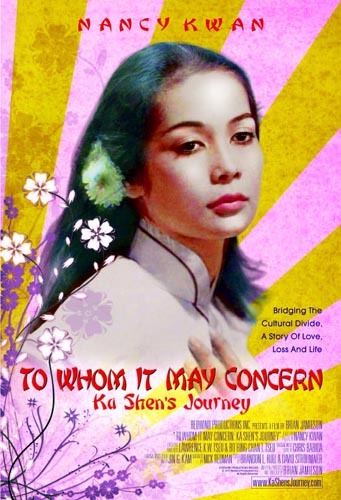 In To Whom It May Concern: Ka Shen’s Journey, produced and directed by Brian Jamieson, we learn that Nancy Kwan was born Ka Shen Kwan in Hong Kong to a Chinese father and an English mother. Hers is a cinderella story that included a jealous Chinese step-mother who entered the picture when her parent’s split up. Visits to her mother in England were also strained. Sent to boarding school there, she made some lifelong friends but sensed being different. Fortunately, she was able to express herself through dance and qualified for The Royal Ballet. Discovered at age eighteen by Ray Stark, a producer seeking fresh faces, Kwan’s movie career was unplanned. Inexperienced when she began shooting The World of Susie Wong (1960), she had the best possible acting teacher, she says, in co-star William Holden. 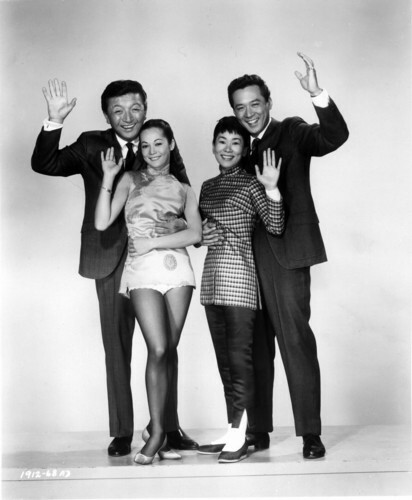 Flower Drum Song cemented the leading man status of James Shigeta. He plays Wang Ta, who’s caught between Linda Low and Mei-Lei, the picture bride picked out by his tradition-bound father. Miyoshi Umeki keeps a twinkle in Mei Li’s eye that saves her from being a complete caricature. Unfortunately, Umeki never stops for a minute looking and sounding completely Japanese, a problem when your character’s name is Mei Li. Helen Chao (Reiko Sato), the nightclub’s seamstress, carries an unrequited torch for Wang Ta. She’s attractive and speaks well but is inexplicably overlooked by Wang Ta in favor of the literally fresh-off-the-boat, Mei Li. In a nationwide search for Asian actors for the Broadway musical, Jack Soo, born Goro Suzuki, was discovered at San Francisco’s Forbidden City. He was initially cast as emcee Frankie Wing but later assumed the role he was born to play, the fast-talking huckster, Sammy Fong. Everyone in the movie is trying to escape tradition, including night club owner Sammy who’s never managed to cut the apron strings of his Empress-like mother, played by Soo Yong. There’s a lot of flab that could have been cut from the movie’s 133 minutes, starting with some of the generational squabbles and fortune cookie aphorisms. Any time the plot wanders too far from Linda Low, things get dull. Then, just when you’re almost falling asleep, Linda appears in a nightie with her dancing shoes on, belting out “I Enjoy Being a Girl” and things couldn’t look brighter.